It’s National Blueberry Popover Day, in these United States. A few odd and end shots of critters encountered today. 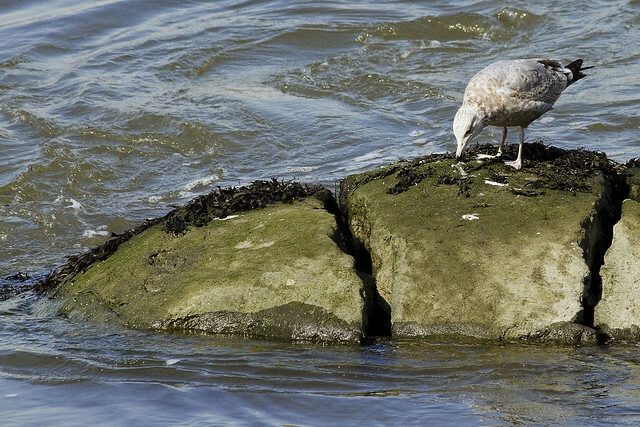 Low tide at Hells Gate will offer you a chance to observe a gaggle of gulls exploiting the exposed intertidal zone. Gulls evolved what turns out to be one of the most important adaptations for survival on a human dominated planet – inedibility. You can actually eat them, but reportedly they taste heavily of all things maritime and you have to worry about worms and accumulated toxins. In their world, Gulls are near the top of the food chain and their diet consists of critters which the environmental activist community would describe as “bio accumulators.” Apparently, there are people who eat gulls, but gussy them up with bacon and a whole pack of spice. Bacon could make a turd taste nice, I believe, but it ain’t kosher. 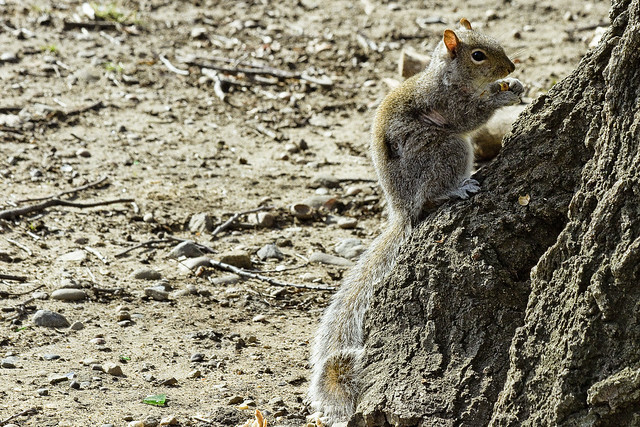 Squirrels are regularly eaten by Americans, although this one from Astoria Park doesn’t have to worry too much about being consumed by a human. It’s main problem are Hawks and Falcons, Dogs and Cats, and Raccoons. 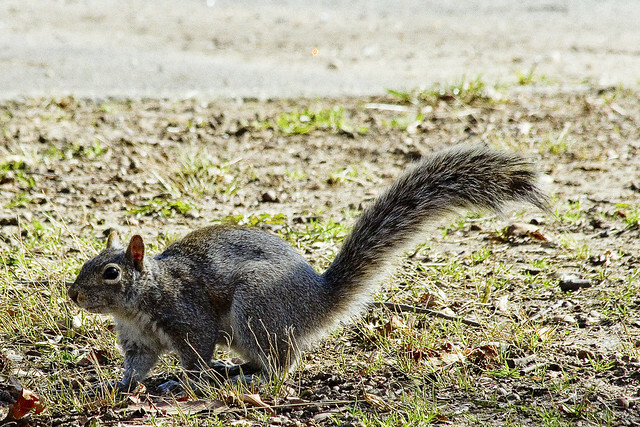 I’m told that Opposums and even Rats will go after squirrel nests. There’s something about the phrase “squirrel nest” that just fills me with an indefatigable whimsy. 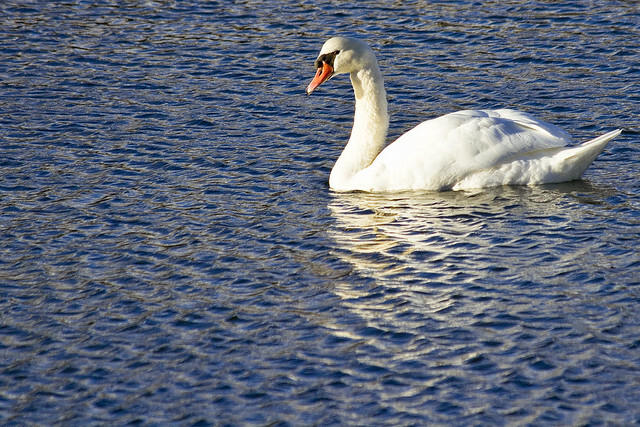 A culinary tradition from Europe continues in the United States, which states that swan meat is reserved for the tables of royalty, and it’s generally not on the menu for us common folk. Another water fowl near the top of its food chain, the Mute Swan pictured above probably has a liver full of mercury and PCB’s, and it’s flesh is likely riddled with parasitic worms picked up out of the sewage laden waters of New York Harbor – or in the case of the bird above, Luyster Creek in Astoria on the forbidden northern coast of Queens. As you many have discerned, it’s time for a humble narrator to organize up his luncheon. Y’know, a blueberry popover sounds pretty good right now. See you Monday, with something completely different at this – your Newtown Pentacle.